Service of the Race to Add Electric Scooters: Who Gets the Bike Lane? Where do Pedestrians Walk Safely? It doesn’t take much to inadvertently kill someone. A few weeks ago a man in his 80s was knocked to the ground exiting a subway run into by another passenger dashing to catch the train. He hit his head and died a few days later. That—and the fact that pedestrians and bicyclists haven’t yet learned to play well together in Manhattan at least—means that the addition here of electric scooters, that go 15 mph, has zero appeal to me. There are too many accidents with good old bicycles: nine deaths and 1,260 injuries to biclcylsits in 2017 according to nyc.gov. That year one pedestrian was killed in a bicycle crash and 172 people were injured by bicycles according to police reports. These stats may be conservative. Read on. Another website, nationswell.com, reported “dozens of bicyclist are killed by motor vehicles every year in NYC.” While I’m most concerned about pedestrians, the numbers of people opting for electric scooters will clearly add insult to injury for all. And how many people didn’t report their confrontations? 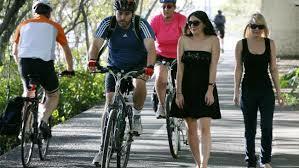 Daily either I or other pedistrians shriek at bicyclists who don’t bother using the [intrusive bicycle lanes] and chug by in a car lane; ignore traffic lights; ride in the wrong direction or zip by on sidewalks. The electric scooter discussion in venues such as curbed.com is focused on pilot programs and safety by rejiggering street design with repaving programs. Shouldn’t there also be a safe pedestrian lane? And who gets the bike lane—electric scooters or bicycles or will already stretched avenues and streets give up yet more space to alternative vehicles to cars? 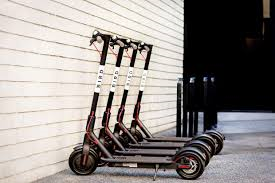 What are your thoughts about electric scooters in cities? I trust that you don’t take me literally and that you realize I write out of exasperation. It’s helpful to let off steam once in a while in a benign way and not make life miserable for others as some of my fellow citizens are prone to do. The most recent affront that awoke the policewoman in me was made by a delivery truck driver for a well known brand who leaned on his horn when there was nothing the vehicles in front of him could do to move out of his way. Nobody was walking in front of him; no car was cutting him off, yet he polluted the air and turned the time we all shared with him on that street into earsplitting misery. ***bus drivers who use their airbrakes with abandon even when they know incoming passengers, some frail, aren’t yet holding on or settled in seats. Note: In some busses it’s quite a distance between the MetroCard fare collecting machine and strap or seat. ***drivers who won’t pull over and stop for an ambulance to pass: Don’t they realize their sister, mother, child, spouse or nephew might one day be inside? 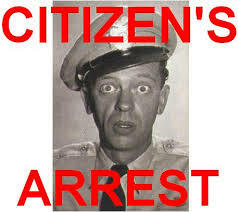 Are there infractions or violations to living in crowded places in a civilized way that you would hit with a citizen’s arrest or warning if you could? Backwards is nothing new to me. I passed economics in college by figuring out the answer and writing the opposite in exams. Long before that, at camp Frog Hollow Farm, we celebrated backwards day. My husband’s printer—an oldie but sturdy–has been acting up. To get it to work I disconnected it from electricity. I was reprimanded by instructions on the little screen when I turned it back on [and it worked again]. The printer told me that I’d turned it off incorrectly and warned me not to unplug the printer from electricity again before first turning it off by hitting ON. New York is a walker’s city. It’s the best way to get many places quickly as traffic on sidewalks is usually easily negotiated unless you’re passing a Broadway theater when audiences convene or exit or around famous museums on Sunday afternoon. 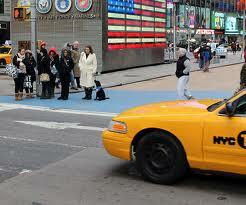 Tourists walk at a slower pace than most New Yorkers while rush hour foot traffic generally moves swiftly. 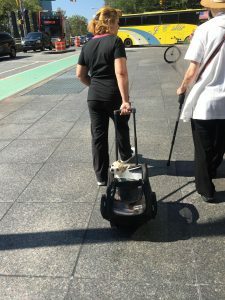 That said, I can’t get over the number of dogs that are carried in arms and in conveyances when out for “walks.” There are suddenly too many of them to explain it as the graying of the dog population in need of assistance. Exercise is as essential for dogs as it is for people. Bicycles are invading the city—racing by on sidewalks now. And bikers pay zero attention to signs on one way avenues informing them that they are going the wrong way [photo top, center taken this week]. To think tax dollars paid for the printing and installation of signs that exclaim the obvious and are ignored! At least one friend was knocked down by a bike that was bucking the tide on a major avenue. Can you share any examples of backwards or counterintuitive behavior that you’ve seen or heard? Some are above the rules. To illustrate the point I’ve chosen a public figure who doesn’t flinch at keeping countless others waiting; bicyclists who ignore traffic rules potentially causing others harm and an actress who doesn’t care if she ruins an irreplaceable museum piece. Mayor de Blasio, [photo, right], holds up the works because he can’t get places on time. His actions tell the public, “Tough; live with it.” He hadn’t held the title long when his reputation was forged: He doesn’t like early meetings and tends to be tardy at any time. Headlines still track his arrival often over the real news–why he went or spoke somewhere. Last week, WOR 710 a.m. morning drive radio talk show hosts Len Berman and Todd Schnitt addressed the lawless bicycle situation in the city. Schnitt, who just moved his family to New York from Florida, said he’s teaching his children to look both ways before crossing a one-way traffic street so as not to get hit. Berman reported once being almost downed by a bike outside a sports arena. Every night as I wait for the light at 53rd Street and First Avenue, where the new bike lane I recently wrote about threatens, I must remind myself to look both up and downtown as bikes speed by both ways. “The resulting image, which Hurley shared with her 164,000 Instagram followers racked up over 3,000 likes in only five days.” He continued, “The V&A has a strict ‘no touching’ rule to preserve its historic exhibits. Touching introduces dirt and oil from the skin onto an object’s surface, which can attract dirt to linger and degrade old and fragile objects.” Her objective was to generate publicity at any cost. She did. There must be better ways to do this while not potentially ruining something irreplaceable. I don’t have to ask one question–I know the answer: “because they can.” What does it take for others to insist on a change? Can you share other examples? Are there exceptions where rules of civility by public figures or of safety should be bent if not broken? I’ve written before about bicycles in NYC, the first time when the cycling program was announced in July 2012 and several times since. In a post a few months ago I described two near-miss crashes as I crossed the street with the light and bicycles ignored me. A recent traffic alteration in my midtown Manhattan neighborhood inspired me to cover the subject again. It underscores my opinion that this city is not bicycle-appropriate and that bicycles are neither traffic nor pedestrian-friendly. New to the East 50s on First Avenue is a bicycle lane next to the curb where cars have parked for decades. [See the photo above. That line of cars is parked!] Parked cars use up what had been a traffic lane [which should strangle the movement of vehicles on the Avenue]. Drivers backing up to park in one of these spaces will temporarily intrude on a third traffic lane slowing movement even more. 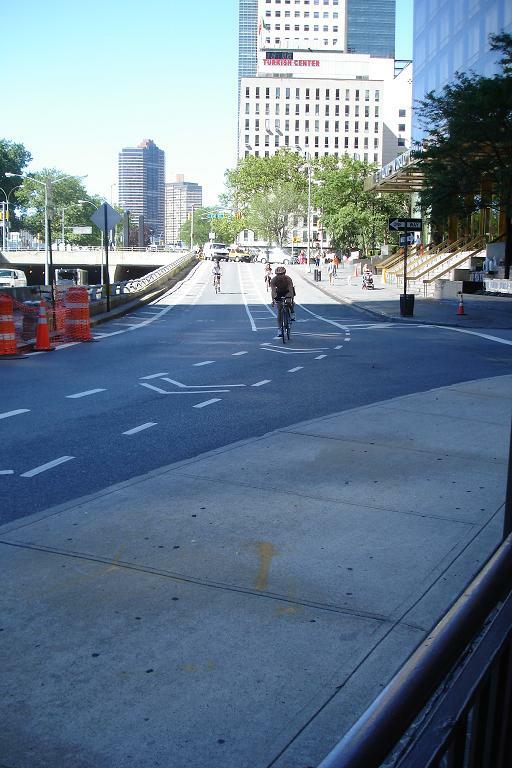 This strategy, designed to protect bike riders, must have been made by a person who doesn’t walk the streets of New York or who isn’t observant. 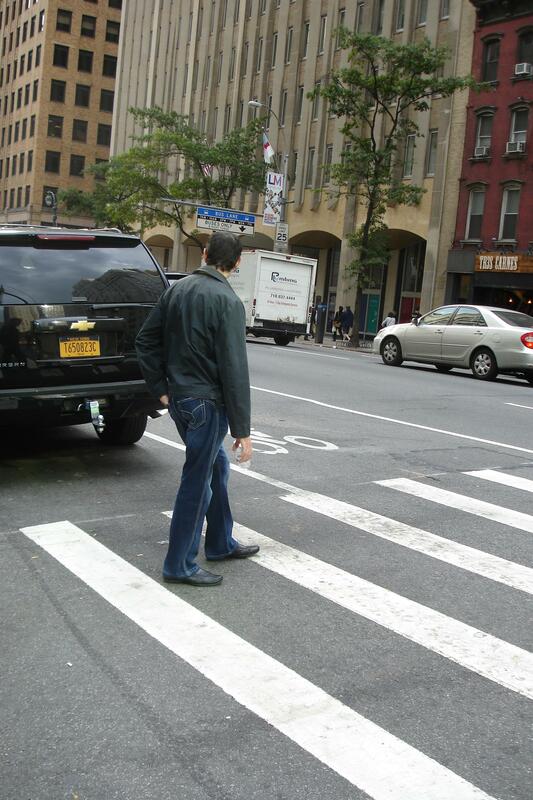 New Yorkers don’t stand on the sidewalk to wait for a green light to cross a street, they stand in the street. Potential BOOM! [The man in the photo at left isn’t even looking in the direction of oncoming traffic!] 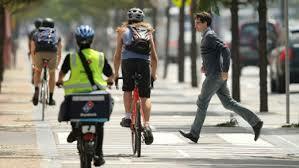 And when drivers push open their car doors to get out, how many will watch for zigzagging bicyclists? BOOM again with potential broken bones and work for auto body repair shops. 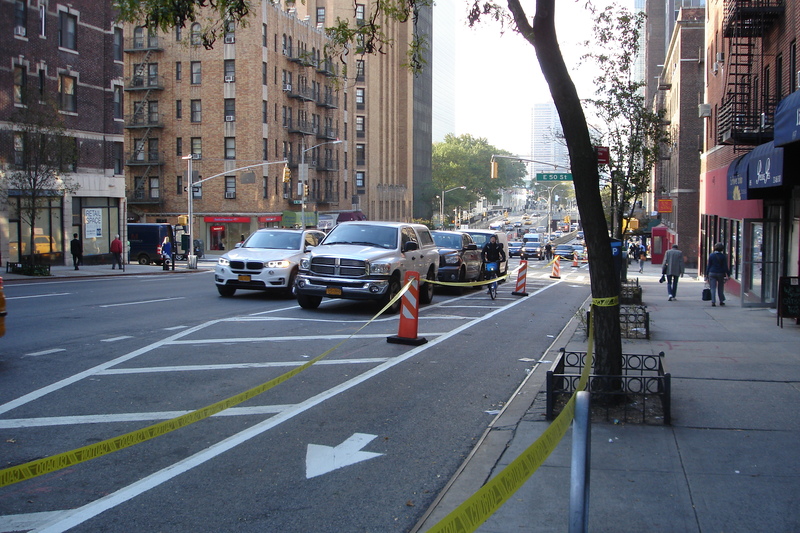 Thursday morning the city cordoned off all the First Avenue bike lanes with yellow caution tape from 49th to at least 54th Streets. I couldn’t see any reason for it and there was nobody to ask. Where did the bikers go? They were forced to squeeze into the traffic. Argh. [See the photo below.] 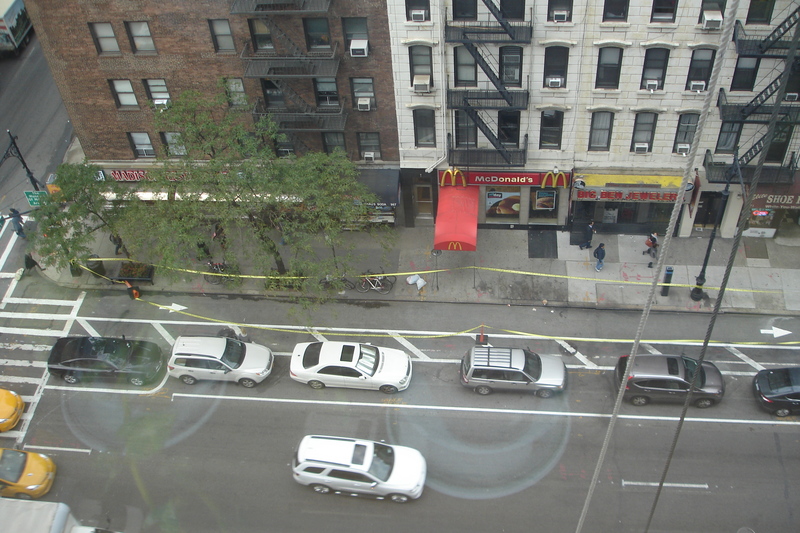 By Friday morning the tape was still there, only on the ground, as were the toppled traffic cones they were taped to. I’m not anti-bike; I’m increasingly not a fan of bicycles in midtown Manhattan where I don’t think they belong. I doubt they alleviate substantially the need for motor vehicles to justify their pride of place. And you? I found out why I so often hear crickets after I’ve held open a door to wait for a much younger person to pass regally past; why some youthful cashiers at full price grocery stores are comfortable watching me place my purchases in bags while they don’t participate; why there’s silence in return when I greet a young tenant on the floor of my office building or in the elevator of my apartment and why I must fight for a spot on the sidewalk if I’m walking against heavy foot traffic at rush hour. I’m a native New Yorker. I know how to negotiate crowds at a clip. At least I did at a time in which citizens respected each others’ space. So what’s the reason for the behavior I described above? These people are VIPs. Here’s proof. David Brooks [below, left], identified them on page 6 of his book “The Road to Character,” [Random House, 2015], which I’ve begun to read [and so far like very much]. He reported responses to a 1950 Gallup Organization query of high school seniors who were asked if they considered themselves to be “a very important person.” Sixty five years ago 12 percent answered “yes,” as compared to 80 percent of seniors asked the same question in 2005. No wonder I was almost run over by two bikers as I crossed the street corner during a short walk in midtown yesterday. The light was green for me but they were in a rush; I was in the way. This VIP approach is a striking turnabout for a person who, as a kid, often heard “The tail doesn’t wag the dog.” In the day we didn’t cotton up much to faux VIPs. We’d giggle at young officers who’d swagger or show conceit or arrogance for no reason when I was the 20-something Air Force wife of a lieutenant the same age. Do VIPs who have earned their stripes resent all this competition? Do VIPs owe consideration to their underlings? Who changes a light bulb in an office full of VIPs? What happens when an artificial VIP disagrees with his/her boss or instructor or when two VIPs are married to one another? Are so many ersatz VIPs only in America? As a longtime driver in both city and country apart from the whammy of nasty weather–especially ice, fog or blinding rain–there wasn’t too much to concern me. 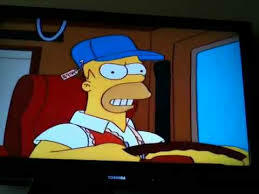 I figured in the city the worst that could happen was a fender-bender given speed limits. Deer surprise-leaping onto roads and smashing into cars are an ever-present danger upstate making vigilance imperative even in sunshine on a crisp fall day. There are no deer to surprise city drivers but the other distractions and impediments aggravated by traditional NYC impatience also affect driving and especially walking in the Big Apple. 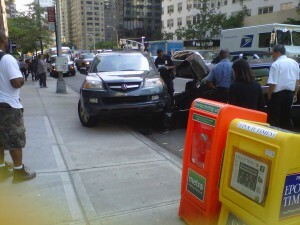 There have always been accidents involving vehicles running over New Yorkers and tourists, even leaping onto sidewalks. They were attributed to road rage, physical impairment and faulty brakes. What’s different is that these incidents–almost misses–have happened over the past two months and I’ve photographed the aftermath. It’s disquieting. 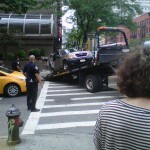 One vehicle [Photo at top] landed on a midtown Second Avenue sidewalk at a time people walk to work. 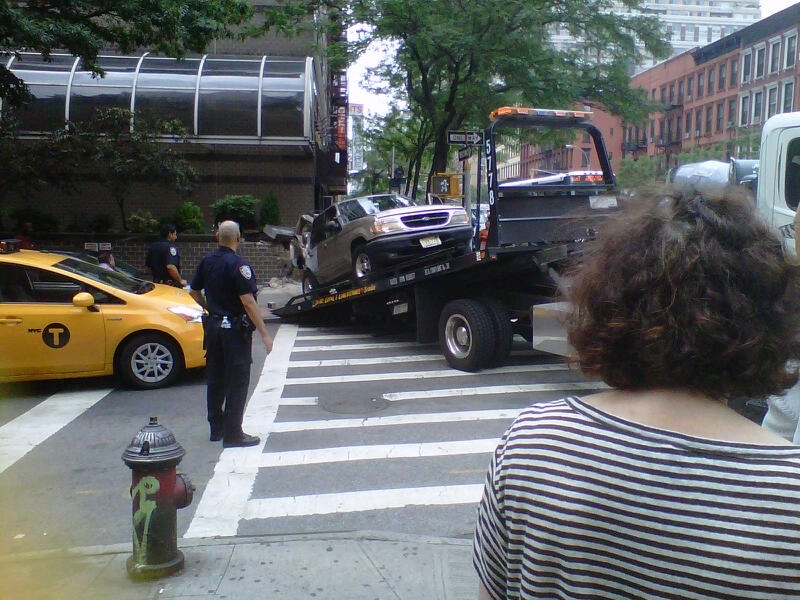 Another [Photo at right] backed up on Third Avenue at such a speed that it crossed a side street, jumped the sidewalk [where pedestrians might have been waiting] and stopped by slamming into an apartment building. In the city I worry about distracted pedestrians intent on communicating as they walk down a sidewalk or wait for a light. They are a danger to themselves. I’m concerned about older people who can’t jump out of the way or children who are intently chatting or are oblivious to their surroundings, lost in the reverie of the music coming from ear pods. 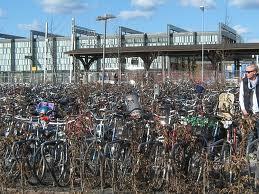 Add bicycles and skateboards that don’t always follow traffic rules. A recent New York Post headline was: “Nicole Kidman bowled over by paparazzo on bike” and showed photos of the actor picking herself off the sidewalk. The East 40s were awash with police during the annual September meeting of the UN General Assembly. I saw a pair crossing a street with the light on Friday morning. One of them barely missed being mowed down by a bicycle. 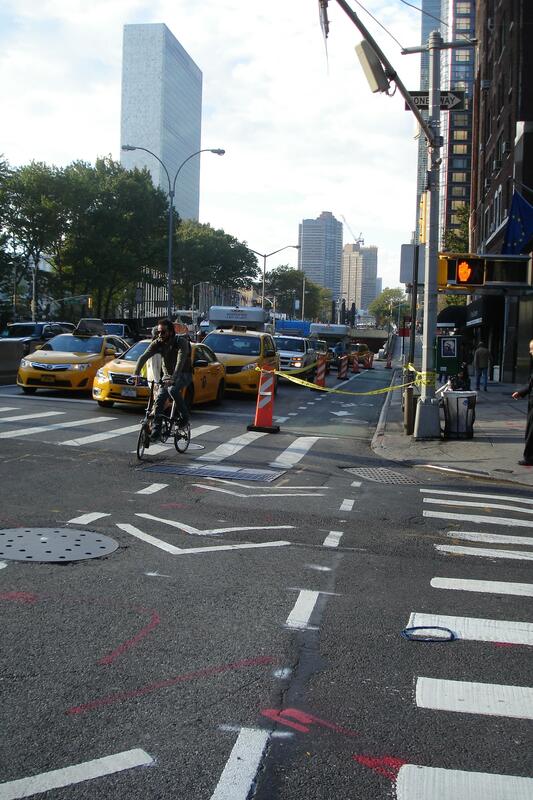 The rider hadn’t stopped at his red light and dashed into Second Avenue traffic treating the city like a racetrack. The policeman put on a brave front chuckling when his partner and traffic colleagues teased him. He might have been severely injured. 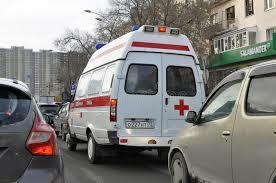 Have you also been aware of increased road craziness in your town or city? 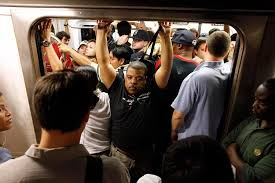 Is it caused by a general malaise leading to distracted drivers and pedestrians or has the well recognized lack of courtesy or awareness of others moved from human interactions to bigger and more physically dangerous arenas? Facebook sent printed invitations to media, delivered by messenger, for a product launch. Hmmmm. Is social media already passé? While I love the concept of a food scrap composting initiative, I think the Mayor needs to first address the way city food is sold and the space constraints of millions of residents. We buy much of our meat, fish, fruit and vegetables packaged on Styrofoam trays covered in plastic wrap so off the bat we need two kitchen trash receptacles. New Yorkers’ microscopic kitchens—especially those in Manhattan–are the brunt of jokes and jibes. In mine there’s barely room for one tiny garbage can which works as we put out garbage daily in the morning and it’s picked up in front of the door. We keep empty bottles on a counter and put them out for pickup separately. 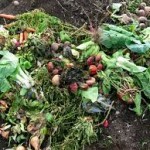 A second can to capture just food scraps will be a challenge for space. 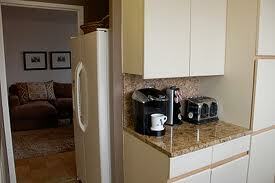 Devoting more countertop to hold garbage is more than unsightly, it’s a health hazard and potential rodent attractant. In giant apartment houses with hundreds of tenants, renters send garbage to the basement via a shoot. Color coded bags–blue for compost, white for paper, green for bottles, pink for plastic and yellow for other garbage–would solve the one-shoot-in-tall-buildings issue if tenants could be bothered to buy them, keep them straight and comply. Some New Yorkers are using the bike sharing Citibikes for exercise in the fresh air. 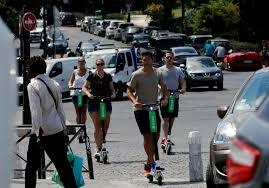 Seems they pedal in place without anyone having to slip in a credit card or join the rental system. That’s a New York kind of moxy that makes me smile. While I think that example is a stretch, an even bigger one is to ask a family to drop its name and heritage. 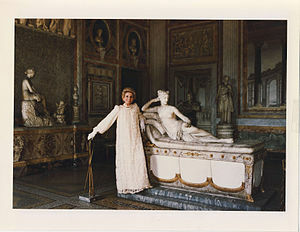 Revlon bought the Borghese cosmetics brand, according to Haughney, along with “the words and phrases BORGHESE, MARCELLA BORGHESE and PRINCESS MARCELLA BORGHESE” and subsequently sold the Borghese Company, now in private hands. The first problem occurred as a result of a press release about one of Princess Marcella Borghese’s grandchildren. He was to appear in a TV program. 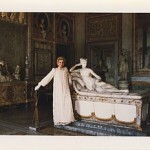 His grandmother was mentioned as well as the fact that she “started the famed self-named cosmetics line, Borghese Inc.” The grandchild was warned against “causing any false impression in the marketplace that there is a connection or relationship between yourself and Borghese Inc. and our cosmetics products.” The next hiccup between the Princess’s descendants and the company came when the grandson applied for a trademark for pet shampoo and conditioner—La Dolce Vita by Prince Lorenzo Borghese–to be sold by PetSmart. The Company sued. Am I reading too much into the symbolism of a social media giant choosing a traditional form of communication? 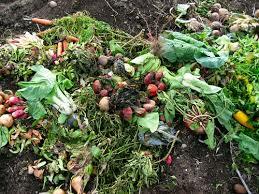 Should tiny NYC kitchens and the way food is sold and tossed in giant apartment buildings stall a compost program? 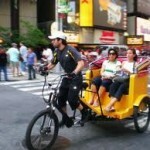 Do you know of other typical out-of-the-box takes on services like NYC bikers using parked vehicles for exercise? Should a family member be forbidden to sell his/her name and others prohibited to use that last name in business forever? One business will get a jolt as a result of the Boston Marathon bombings because it appears that backpacks won’t be allowed at future ones there or in NYC either. Not every one of the some 45,000 runners who finish the NY Marathon depends on them but enough do. Add the smaller events here and elsewhere and the numbers add up. Fanny packs are allowed and will take their place. 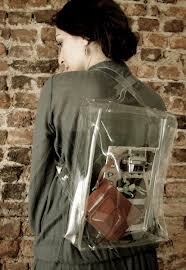 Perhaps transparent backpacks will eventually be allowed. 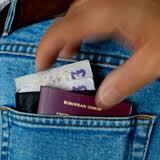 The increased incidence of pickpocketing in Europe will fatten the wallets of manufacturers of money belts and other contrivances to keep tourist cash and credit cards safe. Pilfering got so bad at the Louvre that guards went on strike. Security felt that the Paris police were too easy on the children who perpetrated countless daily thefts. [Why children? They get into the museum free.] On a recent “Travel Show,” Arthur Frommer noted that Paris isn’t the only European city to report record theft and suggested his listeners take care. Airline limits on luggage have impacted that industry and orthopedic surgeon and audiologist waiting rooms flourish from the fashion for platform heels and ear pods on portable music devices. Have you scrambled for matches to light candles on your dinner table or to add calming fragrance to the atmosphere? So few restaurants use matches to promote their businesses. Finger nails are out for Android and iPhone users who expect to type on screens. Look around: There are fewer claws than in the past.The technique for those who use voice-to-text systems harkens back to the dark ages when executives had secretaries and typing pools. They chatted into Dictaphones with letter or memo copy and secretaries typed what they heard. As in days of yore, you can also ask your phone to add a comma and a period. There was no wink symbol then. New Yorkers are split about what to expect from the 10,000 cycles in the bicycle share program again about to launch: Increased lines in ERs perhaps? I’d written about the initiative last summer in “Service of Exercise” when we first expected it and haven’t changed my mind: Thumbs down and I’d like to be wrong. 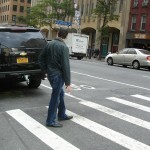 I saw an able-bodied 50-something man walking briskly across Third Avenue at 43rd Street last week. Suddenly he fell flat on his back. He hadn’t seen a deep hole surrounding a manhole cover and lost his balance and his footing. We’re putting thousands of bicycles on these unsound streets? New York drivers are unforgiving and rushed. If you’re crossing where they want to go—what’s a green light?–there’s a 70-30 chance they’ll stop. Maybe the unintended consequence the Mayor anticipates is a more cordial driving attitude. That would be nice. 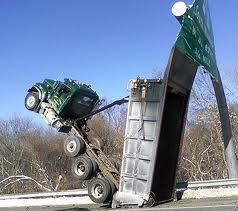 Do you have examples of good and bad unintended consequences or some that are yet to be determined? I am concerned about the mid-July rollout of a bicycle share program in New York City because I predict that there will be gory, even fatal accidents all over the place. If only the bike share program focused on less-traveled areas, but it doesn’t. 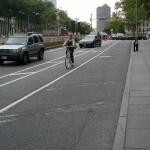 In preparation, bicycle lanes have cropped up all over the city. I pass one on my way to work every morning [photo above]. The setup in this spot can be scary enough for cars and it cries out for accidents without adding bicycles to the flow. Not only do some bikes ignore their marked lane, riding in and out of the space designated for cars, cabs can be parked to let off passengers to the left of the bike lane, [left as the traffic goes], and still other vehicles come in from the street to the left where there is only a stop sign. Pedestrians know that not all drivers interpret that sign as they should–do bike riders from out of town know this? Routinely, taxis, vans and speed demons skid and weave through traffic, accelerating with less than half a block of empty space, even on rain-slick roads, showing concern for neither pedestrians nor other drivers. Why will they suddenly become gentlemen and gentlewomen behind their wheels simply because there are potentially 10,000 rental bikes sharing their streets? 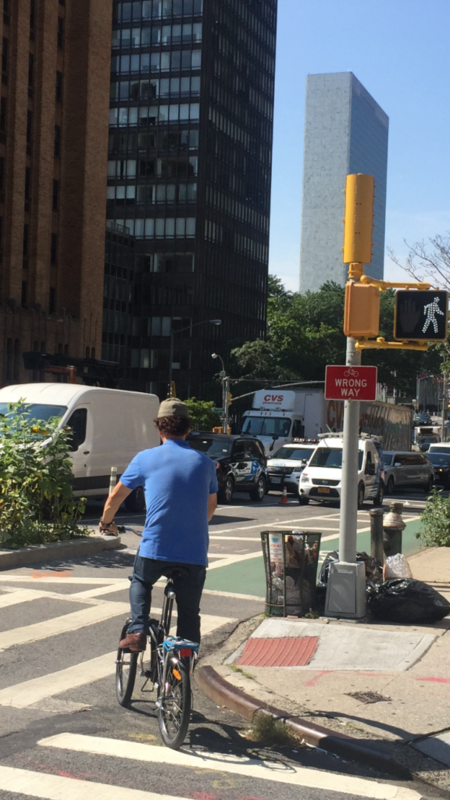 There’s little room for indecision in NYC traffic and my guess is that visitors from bike-riding countries, who might jump at the chance to use them, may not be sure of where they are going. Result: Bang, crash! Apart from messengers and pedicabs, New York City doesn’t have a bike culture although I have a friend who rides everywhere on his. 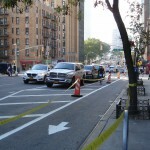 Former NYC Mayor Ed Koch spoke about the failed bike lanes during his administration. On a radio interview last week he said that after they languished pretty much unused, he gave citizens a month to show him they wanted the lanes and when not enough did, he cancelled the program. The difference is that now people will be able to rent the bikes where in the day, there wasn’t a convenient citywide rental program with 600 locations. Bikes take up a lot of space in people’s often compact apartments and there are fire laws that don’t permit bikes to be parked in apartment hallways. There are arguments pro and con regarding the benefits/necessity of bike helmets and the city program won’t require them anyway. 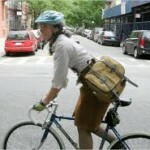 Safety aside, who, apart from bike owners, would have a helmet handy? Tourists wouldn’t think of packing theirs. The thought of renting a helmet [with cooties] is not appetizing. Bike riding is healthy sport–good for the heart–though maybe, given the exhaust in big cities, not so great for the lungs. 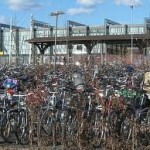 What do you think of the bicycle share program? Will people figure out how to steal them by using fake ID? 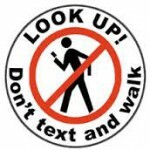 Will pedestrians be at risk? 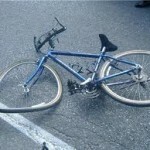 Will there be lawsuits when riders fall and claim their bike was broken?